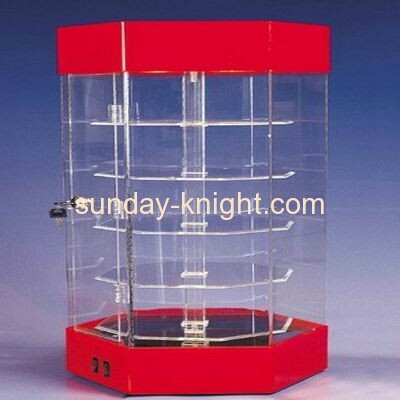 Acrylic display cabinet using imported high-quality acrylic material produced, fine workmanship, modeling novel, lightweight and beautiful, quality assurance. Showcase top can be installed spotlights, the effect of beautiful, changing shape, full-featured. Product diversification, adapted to display all kinds of products: cosmetics, gold and silver jewelry, jewelry, watches, mobile phones, perfume and other products. Acrylic showcase products are made of plexiglass through hot pressing, mosaic, vertical mill, broken grinding, hot simmer, bonding and other methods for processing, display the shelves. The kind of display cabinet bearing strong, good product quality, high technical content, solid structure, diverse colors, versatile, nice, can achieve a very good display effect, has been widely used in shopping malls shops, brought to the vendors Great convenience and good benefits. Acrylic display of the shelves to show the perfect product as the goal, the appearance of fashion, style and diverse, novel is a bright spot, so that your products to attract more customers. Acrylic transparent glass laminate, transparent, can fully display the goods. The top can be equipped with light boxes, you can use the lamp to create an elegant shopping atmosphere, highlighting the goods.